This week's random butterfly photo is a recent immigrant to Singapore, the Yellow Palm Dart (Cephrenes trichopepla). The species originates from the Indo-Australian region. Read the blog article of this species when it was first discovered in SIngapore by ButterflyCircle members. 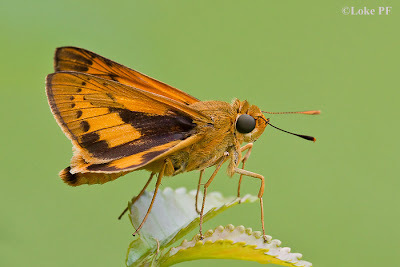 This excellent shot of the skipper perched with the usual Hesperiidae pose was taken by member Loke Peng Fai.